It was late afternoon at Volusia Speedway and it was a hot one. You could almost smell the methanol, the rubber burning, and the aroma of race track burgers coming from the concession stand. 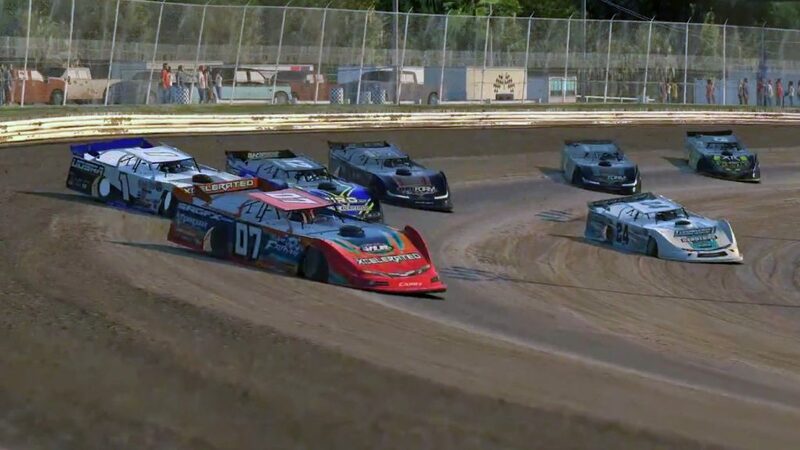 After a hell of a race last week, Howard Weaver was on fire again on a track that he loves, setting the quick time for the sixth round in the championship series. Austin M. Carr was second fastest and sat on the outside pole for heat race number one of four. Weaver got a good start and immediately took the lead in the heat race with Carr close behind. By lap three, Carr was putting the pressure on Weaver. Meanwhile John Fidler and Matt McKinney were battling hard for the third position as we surpassed the halfway point in the race. 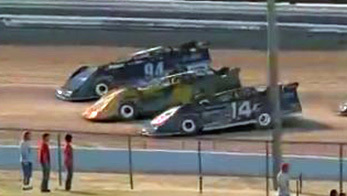 Matthew McKinney in car number 115 and John Fidler in car number 9 race side by side in Late Model Heat Race #1. Three wide on the first lap is never a good idea. Car number fourteen is Casey Dirwood, car number 40 is Joshua Laughton, and car number 94 is Phillip Diaz. That takes us right to the main event with Howard Weaver, who won here at Volusia in the season opener, on the pole. Jacob Fields lined up on the outside of the front row. Austin Carr went to work right away, moving from fifth to third on the race start. Jacob Fields got a little too high and into the marbles (or so it appeared) in turns three and four on lap one and slowed. Alex Bergeron made contact with Fields. Both continued on although they lost a few positions. Garrett Niebruegge got the dirty end of that deal, spinning in turn four and losing a lot of ground. That brought out the first caution flag. Chase Raudman also went around in car number 02. When racing resumed, Howard Weaver led, but Austin Carr was right on his bumper headed into turn one. Alex Bergeron and Jacob Fields went into battle for the third spot. The caution flag flew again on lap five for the number 52 car of James Edens. The field returned to green flag racing on lap nine with Howard Weaver continuing to show the way. While all of the front running drivers were running the high line except for Zach Leonardi who began to challenge Alex Bergeron for third place. Howard Weaver in car number 07 leads on lap twelve. Austin Carr is in second in car number one. That’s Alex Bergeron in third in car number twelve, being challenged by Zach Leonhardi way down on the inside in car number 24. What a race! Carr began the fight on lap sixteen, looking to the inside of Weaver on every lap. Meanwhile Zach Leonhardi had one of the fastest cars on the track but remained in th e fourth position behind Alex Bergeron. The caution flag fell on lap 21 as a back marker looped his car. The race resumed and was uneventful until lap 26 when Drew Herchko got sideways in turn four. Garrett Niebruegge got caught up in the spin and got airborne, leaping over a couple of cars and flying into the outside wall on the front stretch. Weaver continued to lead as the green flag came out again on lap 31. Austin Carr really started putting the pressure on for the lead while Zach Leonhardi did the same for the second spot, battling with Alex Bergeron. Carr assumed the lead with 19 laps to go as Leonhardi also moved into the third position. The top of the track was going away as the cushion had moved up onto the shelf for the most part. It appeared as though Carr and Leonhardi were set up to run on the bottom and had the advantage as the track changed. Tyler Ducharme was also on the move in the number 25 car. Ducharme moved to the low side and advanced to the third position right behind Weaver with 16 laps to go. Caution flew again at that point for the number 007 car of Jacob Fields. Racing resumed with twelve laps to go. Tyler Ducharme continued to charge as he passed Howard Weaver to take the second position. Duchamre then began to challenge Carr for the lead. 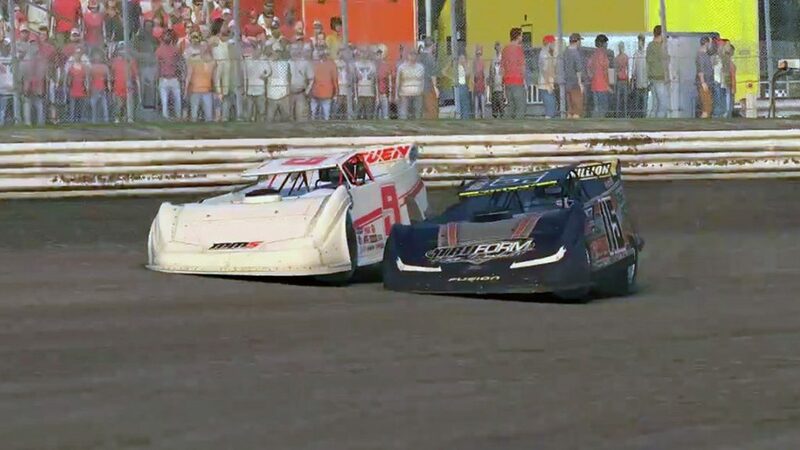 Carr held on and settled into a rhythm for a few laps, pulling away from Ducharme by a couple of car lengths before the caution fell again with seven laps to go. Nick Cooper got tag teamed around by a couple of other cars. ARCA braking and pinballing ensued.